NASA has completed its first round of flight tests for a jet biofuel based on the nonfood plant camelina. Though the final results aren’t yet available, project scientists have reported that emissions produced using the biofuel were reduced compared to emissions from conventional jet fuel. As we’ve reported, NASA began the tests on Feb. 28 to determine the fuel’s emissions and its effects on jet engine performance. The Alternative Fuel Effects on Contrails and Cruise Emissions project is being run jointly by NASA’s Langley Research Center in Hampton, Va.; its Glenn Research Center in Cleveland; and its Dryden Aircraft Operations Facility in Palmdale, Calif. The tests were conducted primarily at the Dryden facility. The tests used a specially modified DC-8 aircraft that’s been fitted out as a laboratory. 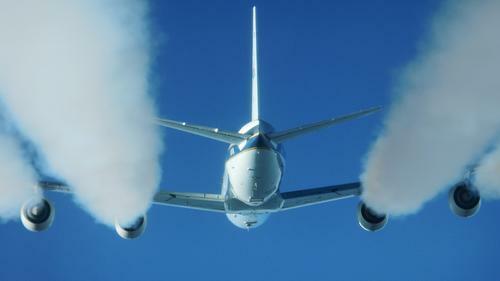 A Falcon HU-25C trailed the DC-8 and measured its emissions, performance, and contrails for more than 15 hours. About 20 instruments sampled various characteristics of the gases, soot, and ice particles emitted by the DC-8. Two different fuels were tested: standard JP-8 jet fuel and a blend of 50 percent JP-8 jet fuel and 50 percent camelina oil-based fuel. Emissions were recorded at different altitudes, different distances between the planes, and different engine power settings. Four more hours of tests were completed on the ground. Initial analysis indicates that the biofuel blend cut black carbon ground emissions by more than 30 percent, but in-air results aren’t yet clear. The plant-based fuel’s effects on contrail formation also aren’t yet clear. According to a press release, the next stage of the project will be conducted next year with a broader range of measurements. The EPA recently approved camelina, a commercial crop, as a low-carbon feedstock qualifying under the Renewable Fuel Standard. The plant is a relative of mustard, canola, and oilseed. Canada’s National Research Council used oilseed in the first flight of a commercial jet powered by a 100 percent biofuel that meets petroleum jet fuel’s performance specifications. Analysis of test results from that flight showed that the fuel was just as efficient as the regular petroleum version in an unmodified engine. The biofuel produced 50 percent fewer aerosol emissions. We’ve also told you about KLM Royal Dutch Airlines making its first weekly commercial transatlantic flight with jets that run on a biofuel blend derived from used cooking oil. Not to be outdone, China Eastern Airlines has run its first test flight using biofuel. An Airbus A320 flew on fuel developed by the Chinese oil refiner Sinopec using palm oil and used cooking oil.